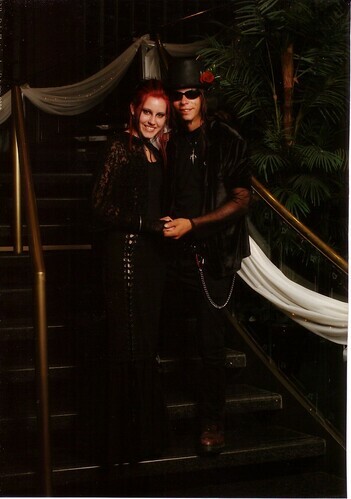 Moonbeams in Cyberspace: THE PRO PROM PICS! 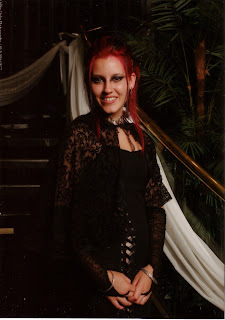 I had promised to scan the proffesional pics taken at the prom so here there are. They took 3 in all. The background is quite dark. I am assuming, to highlight all pretty bright prom dresses that are the *NORM* .. which is fine...it kind of lends well to Cleo's rather dark look if you ask me lol. She was lovely as far as I'm concerned...but mom's are rather parcial lol. Posted by Moon at 2:48 p.m. 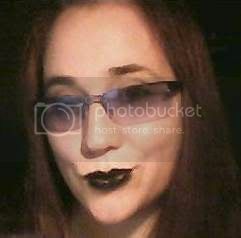 They are rather dark...You know you could try to lighten them and see how that turns out! Just a suggestion. They are quite formal, but lovely! Your girl really has style -- these are great pictures. I think the dark dress with the dark backdrop adds a lot of drama, making for a very sophisticated look. 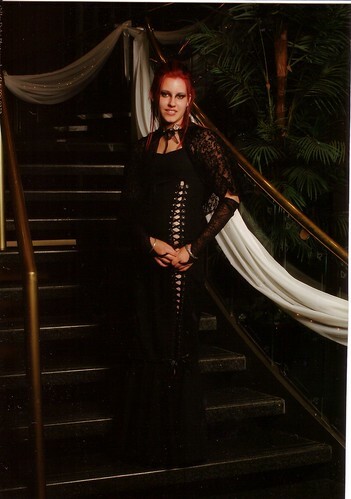 (I'm sure I never looked that glamorous in high school!) These should be fun pictures for her to look back on, years from now. Seriously, in the last pic they look like they were having fun.